I am sitting with my three friends, Gladys Graybill, Hazel Garber, and Millie Zimmerman near the pulpit in front of Bossler Mennonite Church to be baptized. At the prompting of our Bishop Clarence E. Lutz, we kneel, and as we kneel I hear the crinkle of the skirt of my caped dress. Mother and I have chosen a taffeta fabric for this special day – a dress made of tiny checks of navy, silver and white to set off my dark-haired braids now covered with a prayer veiling. The dress has a tiny collar with navy piping. I love that navy piping. Besides the silky fabric, this tiny decoration is the only fancy thing about this plain dress with a cape overlaying the bodice. Since I made a spiritual decision in June, I have been wearing my hair in pigtails topped with a covering. For the first time since then, my braided hair has been pinned up around my head with hairpins in accordance with church rules. But today my prayer veiling has strings dangling from its two corners. Before the service, we have met in the church basement with the Bishop’s wife Elsie Lutz, who has requested that we girls wear strings of white satin ribbon attached the two corners of our coverings, I suppose for an extra measure of plainness. “Oh, you girls look so nice!” she gushes as she inspects our apparel, especially our heads, before we ascend the steps to the main sanctuary. In the name of Christ and His Church I give you my hand. Arise! And as Christ was raised up by the glory of the Father, even so thou also shalt walk in newness of life . . . The wives of the Bishop and the Deacon then give us the kiss of peace, and thus we are received into the church fellowship. 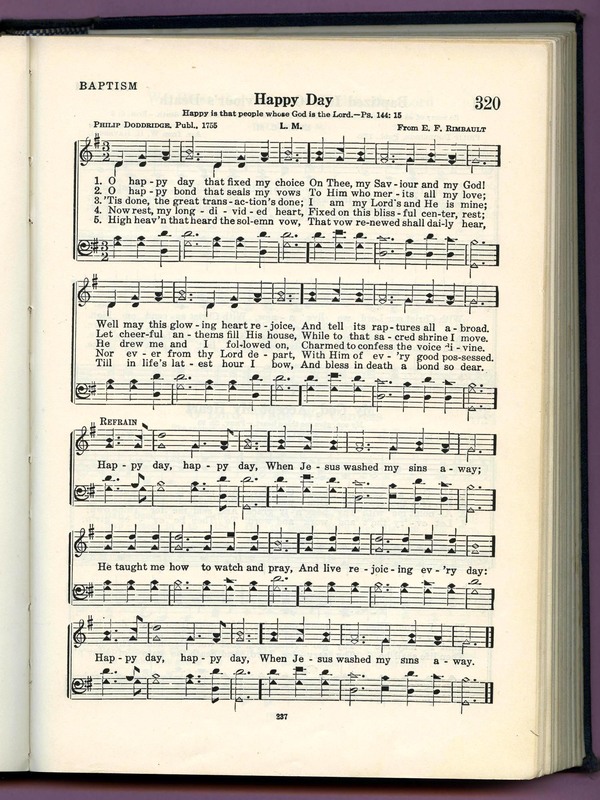 The congregation in four-part harmony happily joins in the tradition of singing “O Happy Day” from the Mennonite Church Hymnal with shaped notes. I remember this day so well. It was September 29, 1951, my sister Janice’s birthday. What special sacred ceremonies have you observed or participated in yourself? My family is not religious, so I’ve not been involved in many sacred ceremonies–only attendance at some weddings and funerals. Very observant, Merril. I realize now that I was searching for ways to express my idea of beauty as I alternately tried to comply and resist church regulations. I like that you always blend your practical observations with your love of history and its preservation. I look forward to your version of baptism with its similarities to and differences from mine. Thanks, Anita. I enjoyed this post so much, as I always enjoy glimpses into your life, Marian. I have been baptized twice. As an infant, after my adoption, my parents had me baptized. (I still have the white lacy dress I wore on that occasion!) 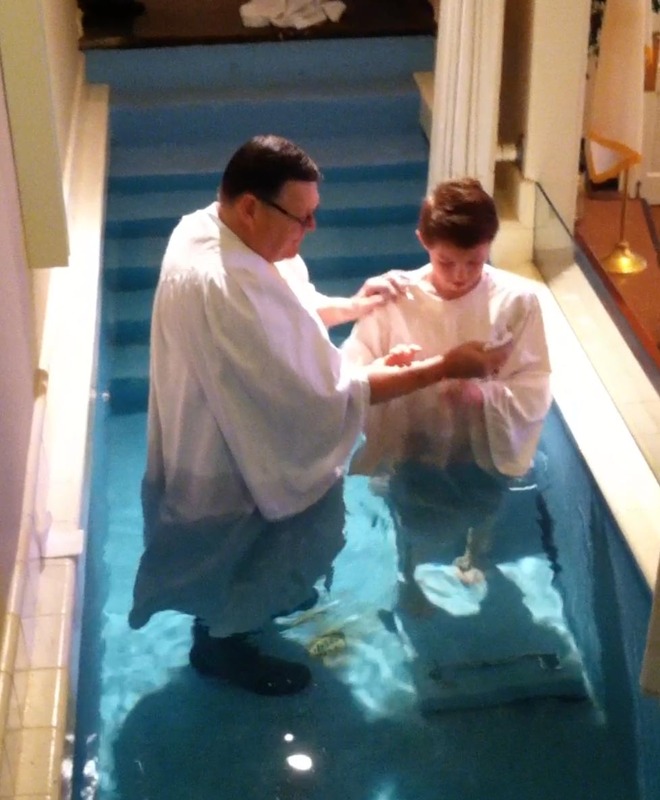 I was baptized a second time, by immersion this time, when I was thirty and accepted Christ as Savior. My memories of that day are precious. Thank you for summarizing a part of your spiritual journey here. I wonder if have that white lacy dress on display or whether you will pass it on to the next generation. And thanks for posting it today; I remember you as one of my very first blog followers back in 2013. Linda, very soon I will be doing a post on gardening, and I plan to provide links to your posts on soil prep and seed planting. Watch out for it on Saturday! Thanks for this opportunity to share and compare. You were baptized before I was born, yet we seem similar in age and perspective! 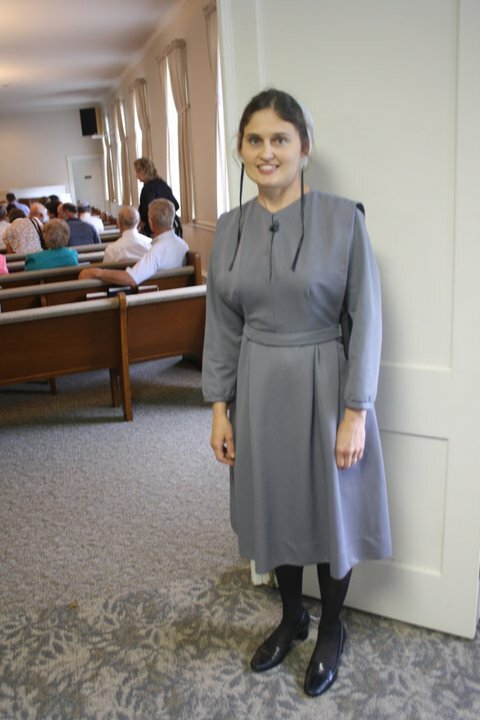 I just checked out your blog on baptism, and methinks I will put a link to this post with the photo from North Goshen Mennonite Church. How fortunate that you have a photo reference to the occasion. I wish I did, but Mennonite then would have gasped at a camera in church. About your comment on age: I’d like to think we are ageless as long as we have curious minds and open hearts. Thanks, Melodie. I was baptized when I was 16, after Little Guy was born. My Mom was worried my Dad (who is not a believer) would make a fuss, so only my Mom and one set of grandparents attended. It was a small evening service, but certainly a “Happy Day” for me! Thank you for a glimpse into an intimate part of your spiritual journey, Jenn. It adds another dimension to what I know about you from your blog and love of photography. How lovely this is Marian thank you, solemnity with joy! A memory from a very long time ago, when I was involved in Bible Study … our group wore white and we immersed ourselves in our pool and committed to Christ. About 30 plus years ago – I’m sure there’ve been others but this is the first that came to mind. I think “solemnity with joy” is the perfect phrase for my experience, and probably yours too as a young woman following Christ’s example. And I love how this post evokes such warm memories. I love your post on your baptism. In all the years that I went to Bosslers I never seen a baptism. It would have been nice to see. 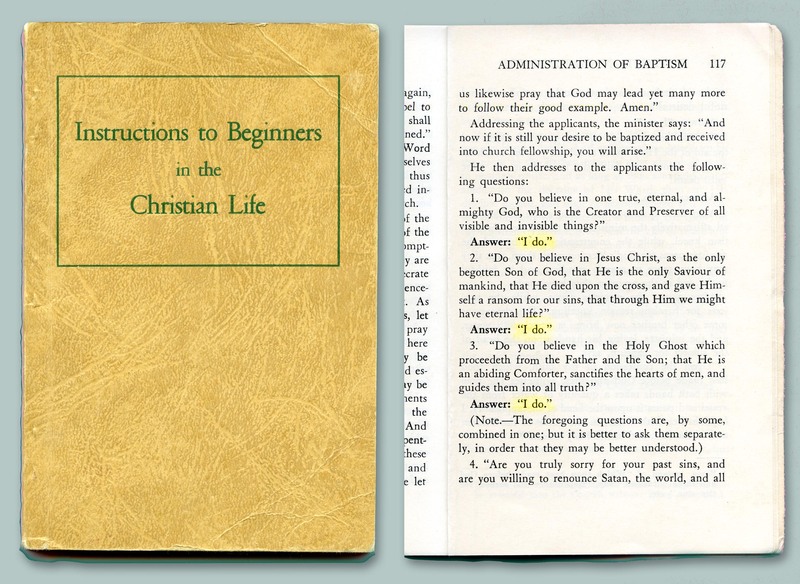 I was baptistized at the age of 18. Then I had the pleasure to see my husband get baptized, my son Nikko, my daughter Linda and last year my three grandchildren Imani, Demetri and Samantha. It was such a great event on those days my whole family come out for the celebration and there were many lol’s. This June we celebrate the quincenera of my granddaughter Imani where she will be adorned and prayed for and given her godly instruction in her future walk with God. This is one of the biggest event in our daughter’s life. As great as it is it also comes with sadness because their mother is not here. Yet I know that God will bless us with her spirit. Your family is a great, big happy tribe with so many wonderful reasons to celebrate, and you have done such a great job as mother, grandmother, and mentor. Yes, it is sad that Linda will not be present at the celebrations, but I have to think she will be there in spirit – grateful for such a strong Mother to carry on family traditions. I hope you can send some photos of the occasion via email. Thanks for continuing your story here, Gloria. I have never had anything like this , apart from our weddings etc , but I do find it so interesting hearing all about yours and seeing your great nephew go through the same ceremony . I think it’s amazing how committed you are to your religion …I admire you and your lovely family . Thank you for enjoying this slice of our life. I always appreciate your looking in and commenting, Cherry. Hi Marian I must tell you that, not only my sister loved your blog on quilts but she’s forwarded it to all her ladies in the quilting group and they are hooked . You are now a famous lady here in Wales so you will have to come and visit us one day ha ha . I would love to, Cherry. Not only would I enjoy your lovely country, but the delight of meeting new friends – including you, of course! Thanks for spreading the word. If they subscribe to my blog by email, they can get regular notifications when I post twice a week. (See right panel on my Welcome page.) Again, thanks! Marian, I love this. Any glimpse into your religious experience is fascinating and this post is rich. I love the way you’re asked to be plain in just the right way, yet get a complement for looking so nice. Life is full of contradictions. I am not affiliated with a church, but I create ritual for myself at the drop of a hat. It can be as simple as lighting a candle for someone, meditating and holding a sick person in my heart, or a complicated ritual marking Solstice or Equinox. Vic’s birthday is on March 7. I’ll be traveling that day, but I’ll take his photo and a candle and give thanks. Elaine, I’ll be thinking of you on Saturday as you observe the rituals of Vic’s passing and being grateful for all the rich memories you shared. It seems the length of time we spend with our beloved family members is never long enough. I’m sure that is so true in your case. Even though my mother lived to be 96, it seems it wasn’t long enough though. As you say so eloquently, love and grief are a one-package deal. Marian — I love how you used your baptism as a descriptive prelude to the crescendo of Patrick and Jenna’s baptisms. Reading between the lines, Laurie, I think you are describing a prank gone awry. Oh, my goodness! You’ve taken me down memory lane again. Thanks! Though our churches are 450 miles apart, my baptism was similar to yours. My older sisters needed to wear cape dresses for baptism but when I was baptized by pouring/sprinkling at the age of 11 I didn’t need a cape, nor did my covering have strings. I remember wearing a white dress. O Happy Day was sung. My father, a pastor, baptized me and my mother gave me the kiss of peace. I don’t have a photo of the event either. We both experienced a slice of Mennonite life now long gone. Even as I wrote this piece, it felt strange and other-worldly to me. But I lived it and, like you, it is part of our heritage. On my Facebook page is a black-white photo that one of my writer friends, Melodie Miller Davis, furnished from her baptism about ten years later in Indiana. However, the dress and the set-up for the ceremony look much as I remember my own. What wonderfully vivid memories. I felt I was there. That’s a high compliment, Marie. Thank you for fueling my engine to help me continue writing down these snippets of memory from long ago. I really enjoyed the way you wrote this story “Oh Happy Day” I recall that song being sung after I was baptized. We seldom sing this song anymore……wonder why ?? I came to B-Ham in V.S. in 1964 met the love of my life and we settled in S. Alabama. We will be married 49 years tomorrow. I graduated form LMS in 1960 ……..what is your maiden name ?? Welcome, Bertha. I see we are both Lancaster County Mennonites who met our soul mates and moved to the South. I was Miss Marian Longenecker, teacher at LMS from 1963 – 1966, so I suppose we are similar in age. Again, thanks for commenting here today! My story – strange but true. I suppose it must seem even stranger to someone outside the culture viewing my sheltered early existence. But, as you would wisely say, it made me who I am! Thanks for reading and commenting here, Debby. Thank your for this, Marian. I too was baptized at Bossler Church (May 2, 1964). Clarence Lutz baptized me and eight others, we used the same instruction book as you, and I distinctly remember singing “O happy day.” Boys were not burdened with much of the dress code requirements. Curiously, we were allowed to wear bow ties but not long ties! Mostly I have happy memories of the experience. Nelson, I have seen the record of your baptism in “The Church on Bossler’s Corner,” a publication commemorating the Church’s bicentennial in 2011. Perhaps you were able to attend the celebration. Thanks for reading and commenting. I’m glad we have a connection here and now on Facebook.